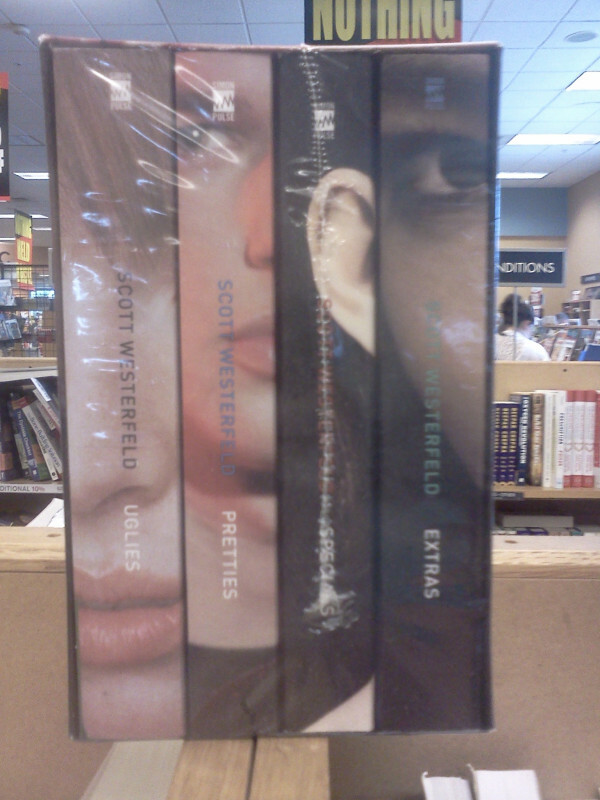 After I finished The Hunger Games, Emily suggested I read The Uglies Series, comprised of four books (Uglies, Pretties, Specials, and Extras) by Scott Westerfeld next. Because I was so deeply impressed by The Hunger Games, I didn’t even ask to borrow the books — I stormed a going-out-of-business sale at Borders and got all four of the books for $25. (Oh, side note: my birthday is in December and I still don’t own The Hunger Games series. I mean. Just a heads up.) Anyway. Here they are! Emily didn’t go into much detail about the series. She gave me her 13-year-old-girl synopsis, which means she told me about the characters and why “they’re cool,” but as far as the overarching plot, she didn’t divulge much. (Perhaps she did that on purpose?) At any rate, I’m almost done with the first book and, while the writing is significantly less engaging than Suzanne Collins’ or J.K. Rowling’s (but certainly light years beyond Stephenie Meyer’s) the storyline is one that I am glad is geared toward teenagers. Uglies is a 2005science fiction novel by Scott Westerfeld. It is set in a futurepost-scarcitydystopian world in which everyone is turned “Pretty” by extreme cosmetic surgery upon reaching age 16. It tells the story of teenager Tally Youngblood who rebels against society’s enforced conformity, after her new found friends Shay and David show her the downsides to becoming a “Pretty”. They show Tally how being a “Pretty” can change not only your look but your personality. Written for young adults, Uglies deals with adolescent themes of change, both emotional and physical. I don’t want to give anything away (because you should read them!) but in the book, the reason everyone undergoes this operation to become “pretty” is because back in the “rusty” time (aka, present day) those who were considered “pretty” were treated better than those who were “ugly.” They got better jobs, better opportunities, and were respected more in society. Back in the days before the operation, Tally remembered, a lot of people, especially young girls, became so ashamed at being fat that they stopped eating. They’d lose weight too quickly, and some would get stuck and would keep losing weight until they wound up like this “model.” Some even died, they said at school. That was one of the reasons they’d come up with the operation. No one got the disease anymore, since everyone knew at sixteen they’d turn beautiful. In fact, most people pigged out just before they turned, knowing it would all be sucked away. Tally stared at the picture and shivered. Why go back to this? Um. Crazy, right? In this series, Westerfeld is straight-up challenging society’s view on beauty, and he’s doing so in front of an audience of those who are arguably the most deeply affected. I am extremely encouraged by this. For once, the media is actually doing something productive concerning the growing problem of self-image, eating disorders, and beauty standards in the world. I’m pretty stoked. Have you read or seen anything lately challenging beauty standards? ← tuesday tip — find a mentor.